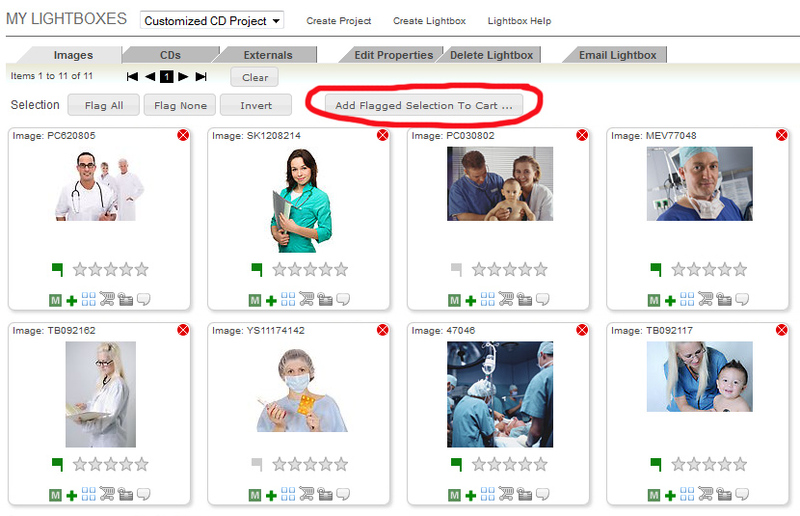 Creating a Customized Image CD is easy using our Lightbox Pro feature to preselect your images. Make sure you are logged into your member account. If you are new to mediafocus.com and don't have a member account yet, please click here to create one. It's free and easy. Once you are logged into your member account click on the "lightbox" link which is located at the top of your screen just above the image search field. Now you have accessed Lighbox Pro, our versatile lightbox feature. 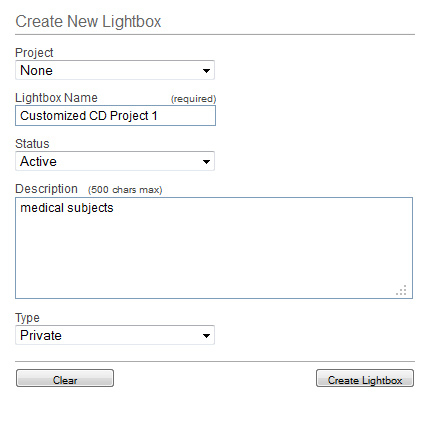 Lightbox Pro comes with a "default" lightbox but you may want to create separate lightboxes for different projects or multiple Customized CDs. Click on "Create Lightbox" to set up a new lightbox. In the dialog box that appears (see below) please name your lightbox, give it a description, make sure that the status is "active", then click "create lightbox". Once you have set up your lightbox (or multiple lightboxes) start searching for images you want to add to your lightbox. To add an image to one of your lightboxes simply click on the lightbox icon below the image thumbnail and select the appropriate lightbox you would like to add the image to. 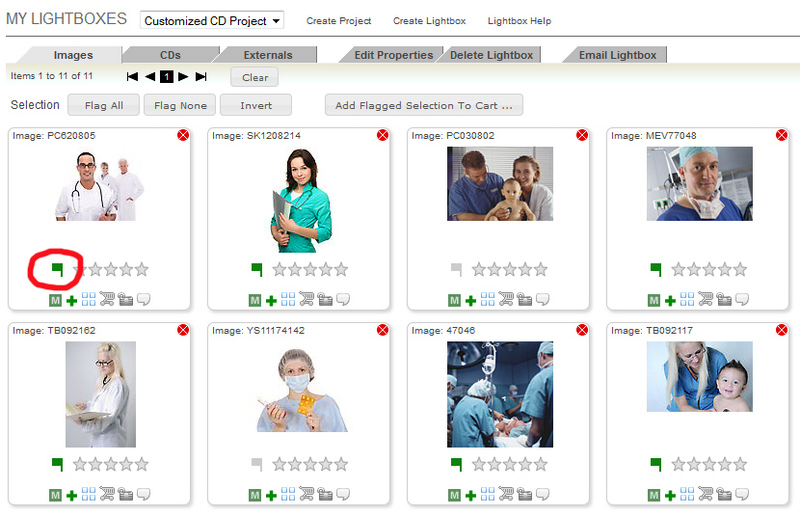 Keep adding images to your lightbox until you have all the images you would like to receive on your Customized CD. Every Customized CD features 100 images. 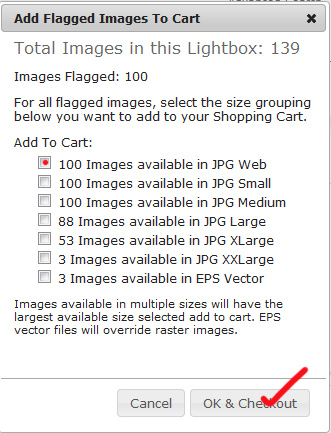 If you selected more than 100 images, you can use the "flag" tool to narrow down your selection (see details under "Adding Lightbox Images to the Shopping Cart" below). To delete an image from your selection simply click on the red little icon in the top right corner of the image thumbnail. 1) Purchase your Customized CD (if you haven't done so already) by clicking here, add the Customized CD of your choice to the shopping cart and follow the simple check-out procedure to purchase your CD. 2) Go back to the lightbox containing your image selection and add all the images to the shopping cart that will be part of your Customized CD. Once all the images are flagged, click on the button "add flagged selection to cart". Now a dialog appears where you have to select your image size. The dialog box will show you how many images are available in the various sizes. Make sure you select the sizes you are eligible to get with the type of Customized CD you purchased. After you've added the images to your shopping cart, click on check-out and follow the simple check-out procedure. The cost will be "$0" as you have purchased your Customized CD already. Should your Customized CD be still in the shopping cart from your previous purchase, simply delete it. The download file for the images will be created immediately and emailed to the email address you've provided in your member account under "account info". Please make sure your spam filter allows you to receive emails from download@mediafocus.com. If you have purchased more than one Customized CD please flag all the images in your lightbox that you would like to receive, then email us at service@mediafocus.com, so we can create the download files for the Customized CDs and email you the links. The automated system can only handle creating one Customized CD at a time but we'll be glad to accommodate your needs if you like to select 200 images, 300 images or more to create multiple Customized CDs. You may also call us at 1-888-232-3686 once you have finalized your selection. Should you have any questions regarding the process of creating Customized CDs please don't hesitate to contact our Customer Support at 1-888-232-3686 or send email to service@mediafocus.com.